Press secretary Sarah Huckabee Sanders says Bolton and Kushner spoke to Prince Mohammed on Tuesday. Turkish officials have said they believe the Saudi writer and government critic was killed inside his country's consulate in Istanbul after he visited the mission to obtain a document required to marry his Turkish fiancee. Secretary of State Mike Pompeo then had a follow-up call with the crown prince to reiterate the U.S. request for information. President Donald Trump says the U.S. is "demanding" answers and wants to bring his fiancee to the White House. President Donald Trump says the U.S. is "demanding" answers from Saudi Arabia about missing Saudi journalist Jamal Khashoggi and wants to bring his fiancée to the White House. 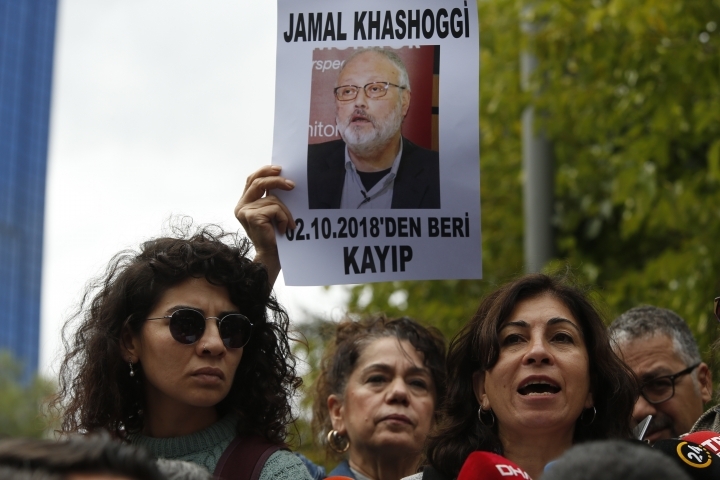 Turkish officials have said they believe the Saudi writer and government critic was killed inside his country's consulate in Istanbul after he visited the mission to obtain a document required to marry his Turkish fiance. Saudi Arabia has denied the allegations. Trump told reporters in the Oval Office on Wednesday that he has a call in to his fiancee, Hatice Cengiz. Trump says nobody knows exactly what happened and expressed hope that Khashoggi is not dead. He says he's spoken with the Saudis about what he called a "bad situation," but he did not disclose details of his conversations. Turkish media have published images of an alleged 15-member Saudi "assassination squad" and video of suspicious movements at the Saudi Consulate in Istanbul following journalist Jamal Khashoggi's disappearance a week ago. The kingdom is already under pressure amid growing international concern for the writer. 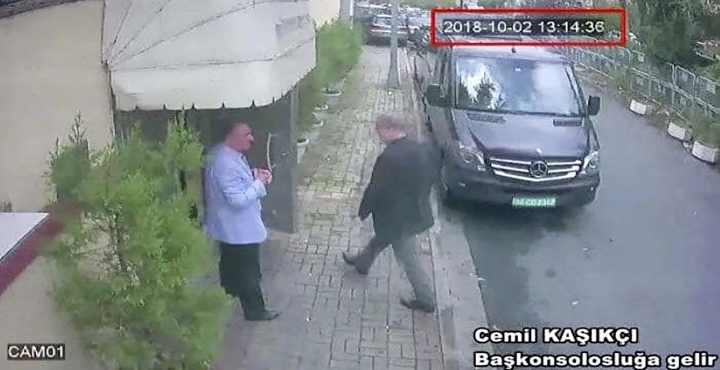 A private Turkish television channel close to the country's president has aired surveillance video of missing writer Jamal Khashoggi walking into the Saudi Consulate in Istanbul and a black van leaving later for the consul's home. News channel 24 aired the video Wednesday, suggesting that Khashoggi was inside of the black Mercedes Vito. The channel said the van then drove some 2 kilometers (1.2 miles) to the consul's home, where it parked inside a garage. Turkish officials say they fear Khashoggi was killed at the consulate last week. Saudi Arabia has dismissed the allegations as "baseless." The kingdom did not respond to requests for comment Wednesday. A pro-government Turkish newspaper has published the names and photographs of 15 Saudi nationals who allegedly arrived in Istanbul on board two private jets the day journalist Jamal Khashoggi went missing. 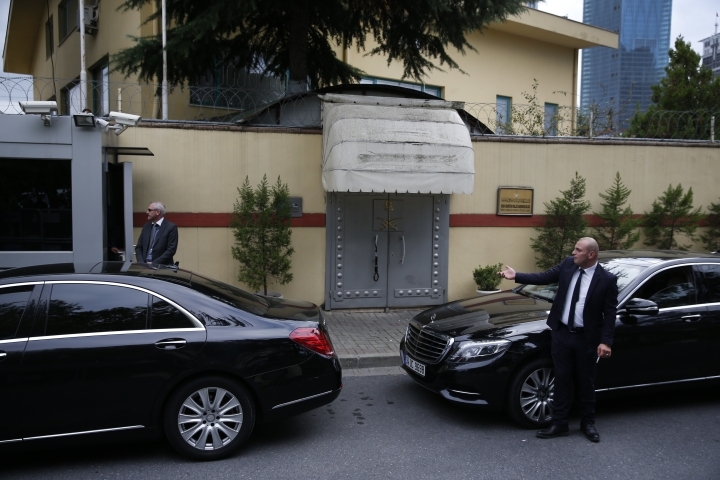 Turkish officials have said they believe the Saudi writer and government critic was killed inside his country's consulate in Istanbul after he visited the mission to obtain a document required to marry his Turkish fiancee. Saudi Arabia has denied the allegations. The paper printed pictures of the 15 Saudi nationals that appeared to be taken by security cameras during police control at an airport. Sabah revealed the times the Saudi nationals arrived and left Istanbul. They checked into two hotels in Istanbul, the paper said. The fiancée of a missing Saudi contributor to The Washington Post is asking President Donald Trump and first lady Melania Trump to "help shed light" on his disappearance. In a column published Wednesday by the Post, Hatice Cengiz wrote: "I also urge Saudi Arabia, especially King Salman and Crown Prince Mohammed bin Salman, to show the same level of sensitivity and release CCTV footage from the consulate." Writer Jamal Khashoggi, who had written critically about Prince Mohammed and the kingdom, vanished Oct. 2 while on a trip to the consulate to get paperwork so he could be married to Cengiz. Turkish officials say they fear Khashoggi was killed, an allegation dismissed as "baseless" by Saudi Arabia. Turkey said Tuesday it would search the Saudi Consulate. Saudi officials haven't acknowledged that.